From the Tonya Harding and Nancy Kerrigan scandal to the double gold medals award in pairs skating at the 2002 Olympic Winter Games, the Chicago Tribune’s Phil Hersh has seen the biggest stories in figure skating unfold from the front lines. 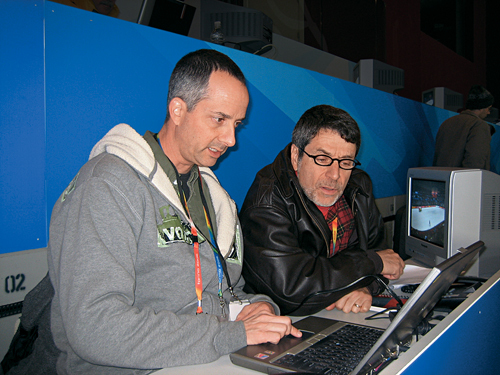 An Olympic beat columnist and reporter who also contributes to the Los Angeles Times, Hersh has extensively covered the sport of figure skating since the 1980s, and is one of the only journalists still covering the major athletes and events outside of the Olympic season. Hersh recently covered the 2009 U.S. Championships in Cleveland, Ohio. He will also be on hand at the upcoming World Figure Skating Championships, March 22-29, in Los Angeles and plans to attend the 2010 Olympic Winter Games in Vancouver, British Columbia, Canada. Over his career, the Yale University graduate has had one-on-one conversations with the sport’s biggest stars including Figure Skaters Online’s Evan Lysacek and Johnny Weir. He has also chatted with former icons including Sasha Cohen, the 2006 Olympic silver medalist who may come back for the 2010 Games, and America’s most decorated skater Michelle Kwan. Before leaving for Worlds, Hersh sat down with Figure Skaters Online to answer questions from figure skating fans. Additional commentary can be found on his Globetrotting blog for the Chicago Tribune at http://newsblogs.chicagotribune.com/sports_globetrotting. Judi (New Jersey, USA): Currently, the only way to watch figure skating is on Ice Network or YouTube. How do you promote a sport that is not given the opportunity to be seen by the general public? Phil: It’s a vicious circle. The sport declines, TV doesn’t want to show it, so it declines more. But TV is in the business of making money, not promoting the sport. Nick (Australia): Mr. Hersh, has the introduction of the Internet helped or harmed how fans perceive the sport? Phil: It should have helped, because fans have access to so much video. The flip side of that is the skating has been so bad that fans are seeing more slop. Doris (Connecticut, USA): Do you think that U.S. Figure Skating is doing the right thing by letting NBC and Ice Network put them under contract to remove most current skating videos from the Internet on YouTube and Daily Motion? Wouldn’t a saner policy involve popularizing the sport via YouTube, a method that many other sports and arts and political groups have employed? Phil: I agree that it would be better for skating also to cut a deal with YouTube, as many other organizations have done, even though they have their own websites. But USFS has the right to protect its investment in Ice Network. Andrea (Illinois, USA): Phil, do you think too much power is given to Ice Network by the USFS? Phil: USFS is trying to make money and expose the sport with the network. It has the right – indeed, almost the obligation – to do whatever it deems appropriate. Zilla (Pennsylvania, USA): What do you think needs to be done by the USFS to kick-start interest in the other three disciplines other than ladies? We can’t just rely on ladies. Phil: Women’s skating always will be more popular – both among viewers and among young kids thinking of trying the sport. Pairs is so dangerous a lot of kids don’t want to try it. Ice dance actually is doing very well, and U.S. dancers also are doing well in competitions. Doris (Connecticut, USA): The United States is much stronger in men’s and dance currently. Are you planning on writing some articles about those events? Phil: I will write often about men, but I give dance little coverage because I do not think it is a sport, even though I think ice dancers are terrific athletically, and what they do is very, very hard. But it’s like judging Nureyev vs. Baryshnikov. Dancing is 98 percent art. Sarah (USA): Now that Caroline Zhang has beaten Alissa Czisny and Rachael Flatt at the Four Continents Championships, do you think it’s fair that she is not going to the World Championships? Should the fate of the entire world team been decided after Four Continents? Brandon Mroz did not perform that well either, but Johnny Weir probably would be healthy by worlds. Phil: I have been pretty clear on this: the team should be selected on results at nationals. But I would be open to a mathematical formula that also puts weight on other events, as long as nationals counted for at least 2/3 of the total, with more recent events (the Grand Prix Final, for instance) weighted more heavily than performance at the previous year’s worlds. To keep nationals a significant event, it needs to be the primary factor in picking teams. Events later than nationals should play no role. Amanda (Michigan, USA): Who do you pick as the World Champions this year? Do you foresee any Americans making the podium in any discipline? Phil: At least one ice dance team will make the podium, especially with the defending champs gone. Evan Lysacek has a good shot, too. I would pick Brian Joubert, Mao Asada, Aliona Savchenko and Robin Szolkowy and whoever the judges want to win dance. Aja (New York, USA): Phil, are you bold enough to pick the medalists for Worlds? Phil: Why not? Joubert, Lysacek, Patrick Chan; Asada, Yu-Na Kim, Joannie Rochette; Savchenko and Szolkowy, Dan Zhang and Hao Zhang, Qing Pang and Jian Tong; Oksana Domnina and Maxim Shabalin, Meryl Davis and Charlie White, Jana Khokhlova and Sergei Novitski. Louis (New Mexico, USA): Phil, if you had to pick a entire World team right now, who do you think would make the strongest showing for the U.S. at the World Championships? Who would you put money on for the Olympics? Phil: I strongly believe a healthy Mirai Nagasu would be the best bet for a chance at a women’s medal. Lysacek and Jeremy Abbott both could be in the medal mix next year, as could Johnny Weir. The ice dancers are solid. After a stunning senior debut in 2008, Keauna McLaughlin and Rockne Brubaker have stagnated this season; they need a strong performance at worlds to project themselves into the medal hunt. Heather (Ohio, USA): Who would you have picked to go to the World Junior Championships in the disciplines? It seems like such a waste to send some skaters, like Caroline Zhang, because they already have experience competing at large senior events. Phil: Anyone in the top three at senior nationals and eligible for senior worlds — whether they make the team or not — should not go to junior worlds. Carlee (Colorado, USA): Thanks for taking our questions Phil. What are your thoughts on the top four at the U.S. Championships in the senior competitions? How surprised are you that only Keauna McLaughlin and Rockne Brubaker were able to repeat in Cleveland, Ohio? Phil: That’s the one good thing about the scoring system. It allows for results based mostly on performance. Sarah (Minnesota, USA): Were there any undeserved U.S. Champions, in your opinion, in any of the four disciplines on the novice, junior or senior level? Phil: I don’t have the time to watch the lower levels. Czisny, Abbott and McLaughlin-Brubaker deserved to win, even with seriously flawed performances in at least one phase. Phillip (California, USA): What do you think of the U.S. Championships in general? Phil: It needs to be a senior-only event that takes no more than four days. Shannon (USA): Phil, where do you think Kimmie Meissner and Emily Hughes would have factored into the ladies field this year at nationals? And what do you think is behind their poor performances this season? I think Meissner has the potential to place within the top six nationally but Hughes will likely be in the bottom half of the field. Phil: As I have written, I think Emily Hughes has had a fine career and maximized her possibilities, which is a polite way of saying she no longer can compete for a medal at nationals. Kimmie Meissner really has struggled for more than two seasons and has shown no consistent evidence of ever returning to her 2006 level. These two young women are among the nicest people I ever have met in the sport; I hope they don’t let their joy for skating be ruined by their struggles. Samantha (Illinois, USA): What do you think Mirai Nagasu needs to do to be competitive nationally again? My second question is what are your thoughts on Rachael Flatt and Ashley Wagner? Phil: Mirai needs to be healthy. Flatt is a marvelously consistent skater who needs only add some pizzazz to her programs to be a medal contender. Wagner showed at junior worlds she still lacks consistency; I thought she won go on from the excellent long program at nationals to be dazzling at junior worlds, but that did not happen. Erin (California, USA): Phil, I think I might have a little bit of a difficult question for you. Why do Mirai Nagasu and Caroline Zhang receive all of the media attention when they are not as good as some of the other girls they are competing against? Both have serious jumping problems but are touted as the successor to Michelle Kwan. I practically overdosed on Nagasu and Zhang in the past couple years but I’ve only read one feature you have done on Rachael Flatt. I cannot recall anything that you’ve done on Ashley Wagner. Phil: Nagasu and Zhang are the most talented skaters in that group, even if their results have yet to match their full potential. Even with its mistakes, Nagasu’s long program at nationals still was more fun to watch than anyone else’s. Liz (USA): How do you view Jeremy Abbott’s Grand Prix Final win in view of some of the comments that have been made about the current group of U.S. ladies? Abbott is 23 and four years ago, he was virtually an inconsistent nobody. He has since found consistency and managed to win the first Grand Prix Final title for an American man. Phil: Let’s not rush to call Jeremy consistent. His free skate at nationals and showing at Four Continents were both below the level of his skating at Grand Prix Final. His short program at nationals was as good as it gets. Sarah (USA): What do you think are Sasha Cohen’s chances of coming back? Phil: In my two conversations with Sasha, she seems committed. While her jumping remains problematic, her spins and footwork were at such a high level in 2006 that they alone give her a reasonable chance at making the 2010 Olympics. Shannon (USA): With the next Olympic Games about a year away now, Michelle Kwan still never has said what she plans to do. Do you think she might return to the sport? Will it be as a competitor or as something more along the lines of a commentator? Phil: I hope she skates again, but I think it is more likely she will reprise the commentator’s role that she has at worlds. Dolores (Missouri, USA): Phil, thanks so much for taking our questions. I have long enjoyed your column and more recently, your blog entries. You seem fascinated with the ladies aspect of American skating despite that there are no real stars and that a handful of them could win nationals this year. Internationally, do you feel that one of the current girls can really achieve something like a world or national title? Or should we American fans pray for Sasha Cohen’s long-rumored return if we want to see a lady succeed in the next few years? Phil: I have answered this question in bits and pieces above. I think Zhang, Flatt and Nagasu all have championship potential, but all are way, way behind Kim and Asada as of now. Kanishka (California, USA): How long do you think it’ll take someone to reach Michelle Kwan’s stature? Phil: Won’t happen again. Michelle is the greatest skater of the past two decades, among the top three or four in history. Jennifer (California, USA): Why don’t you ever give positive attention to skaters not from the United States? Mao Asada and Yu-Na Kim are brilliant. I prefer their skating to Michelle Kwan and Sasha Cohen. Phil: I agree with you that Kim and Asada are brilliant — but we are still waiting for a flawless entire major competition from both. One reason I haven’t covered them as much is I haven’t covered skating as much in the past two seasons. Patrick (Ohio, USA): I don’t believe I’ve seen you write on Yu-Na Kim or Mao Asada. What is your take on their intense rival status, and how do you think Joannie Rochette plays in with them? Phil: I actually have mentioned both Kim and Mao frequently. It’s a great rivalry, but one that plays a lot bigger in Asia than it does in the United States. If the U.S. had a dog in the fight, there would be more attention on these two terrific skaters. At their best, Kim and Asada are 1 and 1A (in changing order); no one else comes close. David (Pennsylvania, USA): Do you think U.S. Figure Skating needs a system similar to USA Gymnastics’ women’s training program in order to get our ladies back on track? Phil: An interesting suggestion, especially since the judging system is making skating as regimented and repetitive as gymnastics. But there are no Karolyis in skating — coaches whose influence on the sport has been all-encompassing. Plus, there is no team event in skating. But the idea of national team camps seems a plausible one — as long as the coaches go along with it. Kay (Michigan, USA): Why do your columns tend to focus on what is not going on in U.S. skating, like the lack of a leading lady, instead of what is going on, like the international rise of the American men and ice dancers? We might not have a strong ladies field, but our men’s and ice dancing field might be the strongest in the world overall. Phil: My feelings about ice dance are clear. It is entertainment, often over-the-top, not sport, so I frankly don’t care about it except when you have a Jayne Torvill and Christopher Dean or a Pasha Grischuk or others whom I write about as personalities, not competitors. The “international rise” of the American men has not produced a world champion since 1996 or a silver medalist since 2003. David (Pennsylvania, USA): How do you rank the U.S. men’s chances going into worlds and the Olympics? How do you rank Jeremy Abbott, Johnny Weir and Evan Lysacek against one another, although Weir is not going to worlds? Where does Brandon Mroz realistically factor into this? Phil: I think Lysacek is in the ascendancy again, especially after resurrecting his quad, but none is a clear leader. Mroz is the skater to watch at the Olympics… in 2014. Rich (Washington, USA): What are your thoughts on Jeremy Abbott? I wonder if he has simply been the benefactor of several high-profile retirements as well as the poor showing from Evan Lysacek this season, which prevented him from making the Grand Prix Final. Is he the real deal or is he real lucky? Phil: Jeremy has benefited from the retirements and Joubert’s injury at the Grand Prix Final, but he also has made the most of the opportunities, and he skated very well in GPF and extraordinarily well in his nationals short program. I think back to Tara Lipinski: made the ’96 worlds team when Bobek was dumped, rebounded after a horrible short program at ’96 worlds, catapulted from there to world and Olympic champion. Seizing opportunities is what makes champions. Sylvia (Ohio, USA): A lot of people were under whelmed by Evan Lysacek’s work with Tatiana Tarasova. What do you make of it? And do you think that his back-to-back Grand Prix events, instead of two with weeks in between, at least play a small part in why he wasn’t as successful as we have expected him to be? Phil: Evan seems to have scrapped much of what Tarasova did, from costume to choreography, so there is your answer. I don’t think the back-to-back events had anything to do with it. He just had a bad patch. Samantha (Illinois, USA): Who do you prefer out of Evan Lysacek and Johnny Weir? Also, do you think that either Lysacek has a realistic opportunity to win the 2009 World Championships or that Lysacek or Weir could win 2010 Olympic Games? Phil: I think both have a chance to win those competitions, although it would be an outside chance. I prefer whoever skates well: Johnny’s short program at 2006 nationals was heart-stoppingly brilliant; so was Evan’s long program at 2007 nationals. I hope Johnny gets himself back together to be a serious challenger again next season. Sammy (Massachusetts, USA): Do you think Evan Lysacek and Johnny Weir actually dislike each other? Or is that some type of show that they put on to make people pay attention to them? I think it’s a sad act that makes both of them, especially Johnny, look terrible. Phil: Let’s just say they won’t be breaking bread together any time soon. They simply have little in common other than the sport. Despite the occasional digs — mainly by Johnny — there is no doubt they respect each other as skaters. And whatever show they put on is good for a sport that is dying for attention — and maybe just plain dying. Candice (New Jersey, USA): What do you make of Adam Rippon leaving Nikolai Morozov? And Phil, do you think Adam has any place among the top American men right now? On a good day for all the skaters, can he compete with Evan Lysacek, Johnny Weir, Stephen Carriere, Jeremy Abbott and Ryan Bradley? Phil: I think Adam and Brandon Mroz will be the top two by 2011. As for the decision to leave Morozov, skaters change coaches more regularly than not. But let’s look at several of the world’s most successful skaters in the past many years: Katrina Witt, Todd Eldredge, Brian Boitano, Evgeni Plushenko, Michelle Kwan (until 2002). All with one coach. Leigh (Indiana, USA): Phil, Ryan Bradley beat Evan Lysacek at Skate Canada. What do you make of that? Phil: Results should depend on performance, the way they do in ball-and-bat sports, where the presumed better team or player frequently loses. Leigh (Indiana, USA): What are your thoughts on American pair skating and ice dancing? Phil: My thoughts on ice dancing have been expressed above. In 2008, McLaughlin and Brubaker showed the potential — speed, power, charisma — for greatness; they have yet to fulfill it. U.S. pairs rarely match up with the best, but that may be changing by default: there are no Chinese successors on the horizon, and the breakup of the Soviet Union has, after nearly 20 years, undone Russian pairs skating — junior world champs or not. Leila (Oregon, USA): Phil, obviously Keauna McLaughlin and Rockne Brubaker are the supreme American pair with Rena Inoue and John Baldwin far behind, especially the more time they spend away from skating. My question, what are your thoughts on Caydee Denney and Jeremy Barrett? Is it realistic to expect greatness at worlds and the next season? What do you think of the other American pairs like Brooke Castile and Ben Okolski, Tiffany Vise and Derek Trent, Amanda Evora and Mark Ladwig and Caitlin Yankowskas and John Coughlin? Phil: None of the U.S. pairs you mentioned, other than McLaughlin and Brubaker, are worth discussing as world contenders. Denney and Barrett had one good short program and were non-factors at Four Continents. If they skate well at worlds, regardless of where they finish, then one can begin to think of them as more than 2-minute, 40-second wonders. Danielle (Arizona, USA): Phil, why was there so little attention paid to Tiffany Vise and Derek Trent becoming the first pair in history to land a throw quadruple jump? I think with the state of U.S. pairs, that would have been a story line to tell. Phil: One-trick pony. Like Baldwin and Inoue throw triple Axel. Ekaterina Gordeeva and Sergei Grinkov did a quad twist at the start of their senior career, but they became truly great because of their skating when they no longer did the attention-getting move. David (Pennsylvania, USA): Do you expect Meryl Davis and Charlie White to surpass Tanith Belbin and Ben Agosto now that they have Igor Shpilband’s complete attention? Phil: Don’t know, don’t care. Amy (South Carolina, USA): Phil, who are the few people who could surprise us next season? I know you have your eyes on some novices or juniors that you think could be our 2014 Olympic gold medalists. Phil: I’ll be looking at the 12-year-old Russians who were 1-2 in their national championships. They clearly are being groomed for Russia’s 2014 Winter Games. Andrew (Colorado, USA): How do you view the current crop of American juniors in all the disciplines? I am interested in knowing who you might think are the future stars of the sport. Thanks for taking the time to answer our questions Phil. We appreciate your coverage of our sport. Phil: I cover so many other sports I don’t have much time to pay attention to juniors, except the rare cases of Lipinski and more recently, Zhang-Nagasu-Flatt. Nick (Australia): What are your thoughts on the current IJS versus the 6.0 format? Phil: At the beginning, I liked the concept of the International Judging System, but it has become a misused joke, with negative scoring based on insufficient video evidence, so many technical demands it discourages individuality, under-valuing of quad jumps and use of the component scores (which should be called proponent scores) to prop up skaters. After six years, it needs a thorough overhaul and, on top of that, it is too expensive. But International Skating Union President Ottavio Cinquanta simply is pig-headed about any overhaul of what was a well-intentioned idea and one that he had discussed with me seven years before the Salt Lake scandal, which really was no scandal, because the Russians were better. With 20/20 hindsight, I think a better answer would have been to use a system more like diving’s, based on either 10.0 or 6.0, with all the scores added and the high and low judges’ scores dropped. The anonymity part and random selection no longer functions the way it should since economics have reduced the number of judges at each competition. I wasn’t in love with the 6.0, but I am in hate with the NJS or IJS or whatever one wants to call it. Joe (New York, USA): How much value do you put in personal best scores since judging is really uniform? Phil: I use the numbers, but they really don’t mean much. Patrick (Ohio, USA): I think everyone would agree the code of points (CoP) system is flawed. However, many of your critiques in past articles simply lack basis. Why are you so adamant in your writing that there is no room for artistry in this system, when we have skaters like Jeffrey Buttle and Jeremy Abbott taking the world by storm in the past two seasons? Phil: There is little room for artistry in the new system. Period. If you consider artistry a program with major mistakes, then you have a different vision than I do. If artistry means not challenging yourself technically (no quad jump), then the sport is diminished. Nick (Australia): With the number of skaters put out of action because of attempted quad jumps, should it be banned for good? Phil: Absolutely not. It should count more so skaters will perfect it, and the demands of the rest of the program should be lessened. Tim Goebel, Alexei Yagudin, Ilia Kulik, Evgeni Plushenko all had long careers with quads, and some injuries, which happens to all athletes. Eliminate one spin. Put a limit on total jumps — seven or maybe eight. Give the skaters time to breathe and be creative. Jeff (Rhode Island, USA): The jump technique of some of the skaters is completely wretched. Should figures be brought back to correct that poor technique? Phil: I’m not sure figures had anything to do with jump technique but rather with edge quality and speed. Doris (Connecticut, USA): Why do you think that USFS allows little skaters to pass their early tests for jumps on the wrong edge? Or how else can you explain how many American ladies jump off the wrong edge? Phil: It has gone on for years but little attention was paid to it. And the whole over-scrutiny of which edge on flip/Lutz has been reduced to absurd nit-picking. But maybe women should not do Lutzes until they are strong enough to withstand the physical forces trying to pull the body inward to start the rotations while trying to hold the outside edge. Faith (Ohio, USA): How did you go from studying French in college to being a sports journalist? Phil: Bonne question. I have always loved to write, and writing about international sports gave me a chance to explore many things — culture, politics, personalities and performance. But I believe a college education is about learning to think, express one’s thoughts and defend them against people smart enough to find flaws in your reasoning. I have liked French literature since I began reading it in ninth grade, and Yale had the country’s best French department when I attended. So I simply was educated to write and think in a different language, but the goal was the same. Doris (Connecticut, USA): How did you first start writing about skating? Paula (Michigan, USA): How does it feel to be one of the last remaining journalists still covering figure skating live? What do you think is responsible for the demise of journalists covering the sport? Is it the sport itself or is it the industry? Phil: It reflects both the decline of the sport and the economic problems of newspapers. And then there are idiotic things like the schedule at this worlds, with events so late the Washington Post and Detroit Free Press, both regulars in skating coverage, decided it was not worth the money to send someone if the stories can’t make print editions, no matter the significance of digital. Amy (South Carolina, USA): As you know, U.S. Figure Skating has made the 2010 U.S. Championships into two weekends with the men’s and pair skating competitions one weekend and then the ladies and ice dance the following weekend. How is that going to affect you as a journalist covering the event? Are you planning on covering both weekends? And how do you think the change is going to affect the sport, primarily how many people actually attend the championships? Phil: Many papers already are talking about just one weekend. I likely will do both because I have the option of visiting a son at college in California for a few days, which the paper won’t have to pay for. What NBC wanted, NBC got; but let’s see if NBC is around after 2010. Kanishka (California, USA): As a journalist, what is the most fascinating story you’ve covered? Phil: Other than Tonya Harding and Nancy Kerrigan, you mean? I presume you want this limited to skating. I remember the stunning performances: G&G and Boitano in Calgary, Kwan at 1996 worlds, Rudy Galindo winning at home in San Jose, Yagudin in Helsinki, Sarah Hughes in Salt Lake, Kulik in Nagano, Lipinski in Nagano, Browning doing Bogey, Oksana Baiul at 93 worlds, so many, many more. Yuka (Washington, USA): What was the most heartbreaking story you’ve had to cover? Phil: In skating, it would be Carlo Fassi’s untimely death and Chris Bowman’s demise. David (Canada): Who do you think is the most unjustified champion of the past 10 years whether it be a national champion, world Champion or Olympic Champion? Phil: Surprisingly enough, I have always felt the judges somehow got the right winner nearly all the time, although the seconds and third have often been debatable. Helen (USA): Thanks so much for your continued coverage of figure skating. I was surfing the net last week and came across interviews that you had done shortly after the 2002 Olympics and one with members of the Michelle Kwan Forum. In the first interview you said that you would have placed Michelle Kwan in third in the long program in Salt Lake City with Cohen in second and Slutskaya in 4th. In the later interview you said that you would have placed Kwan second in the long program, most definitely ahead of Slutskaya with no mention of Cohen. Why the change of position? If you feel that Kwan deserved a second place in the long, which would have given her the gold medal (by the rules of the sport). Why didn’t you say so at the time? Phil: Your memory is better than mine. The benefit of watching something over and over again changes opinions some times. Live and on deadline, I thought Slutskaya was better; over several replays, I was convinced Kwan was better. I still would have given Hughes gold, since she clearly won the long program, and I would have had her third in the short program. Tom (Florida, USA): What are some of the other sports that you devote coverage too? Where does figure skating rank among your favorite sports to cover? Phil: My main summer sport is track and field, but I have covered almost every sport. I really like NCAA women’s basketball tourney and women’s sports in general, because we don’t give women athletes enough coverage, and I have found 99 percent of them — even the biggest stars, outside of tennis and golf — to be unfailingly gracious. All I ever ask of an athlete is common courtesy: if you don’t want to talk with me, just say so politely — an idea beyond the reach of most major sport stars. That I have covered skating for 29 years (always at my own initiative) says how much I like it, but I am losing interest rapidly because of the judging system. Jennifer (Kansas, USA): Were you, your wife or your son ever figure skaters? Phil: My son played hockey. And so did I, on a much lower level, because I was — and am — a horrible skater. John (New York, USA): Phil, I appreciate your coverage of skating but I have some questions stemming from your coverage of the Beijing Olympic Games. What was it like to cover a Games where you did not have freedom of information and certain Internet sites were blocked? How did the Games, overall, compare to others that you have covered? Phil: The blocked Internet sites were annoying but did not affect my coverage because I used non-China proxy servers to get around them. The Games were brilliantly organized in a passionless atmosphere, because the Olympic Green was locked down, preventing the non-ticket-holding Chinese citizen from sharing and expressing joy over this great event and its strikingly beautiful stadiums. Shannon (USA): Where do you think Michael Phelps factors in on the greatest athletes of all time? Is he up there with Michael Jordan? And would any figure skaters be on your list of the 100 greatest athletes? Phil: In a column during the Beijing Games that stirred up much controversy, I ranked Phelps’ fifth among the greatest Olympians, moving him up to fourth when swimming ended. Sonja Henie would be on the list because of her wider impact: the Zamboni was created for her as were the first real ice shows; her popularity in the US was so great (she and Shirley Temple were the two biggest box office movie stars in the late 1930s) that it carried across WWII and led to the great North American women who followed: Scott, Albright, Heiss. Jim (Massachusetts, USA): Phil, what are your thoughts on Michael Phelps getting caught with a bong? How about Alex Rodriguez admitting to steroid use? Does skating need a story like this to peak the public’s interest? Phil: May I refer you to the archives of my Globetrotting blog for my opinions on those subjects? I’m not sure doping in skating or reefer madness in skating would pique the public’s interest. It will take another great U.S. skater, since I don’t think even a redo of Tonya-Nancy would have the same impact. Jamie (Arizona, USA): Phil, thank you for taking the time to answer questions from figure skating fans and the avid readers of your work in the Chicago Tribune, Los Angeles Times and the Globetrotting blog. Any final thoughts before the World Championships get underway? Phil: Come back, Michelle and Sasha. Jamie (Arizona, USA): For more information on Phil Hersh, visit his Globetrotting blog for the Chicago Tribune at http://newsblogs.chicagotribune.com/sports_globetrotting.